We head inside the fast-paced world of buying and selling produce. Skids of produce in the Ontario Food Terminal farmers’ market. It’s Friday at 3:30 a.m., the sort of hour that falls into the uncertain realm between yesterday and tomorrow. I’m outside the Bondi Produce head office on an industrial side street in South Etobicoke. A wall of docking bays is filled to capacity, with cube trucks being readied to service a bevy of restaurant and retail-store clients across the Greater Toronto Area. Business is booming. Bondi’s head produce buyer is a man in his late 40s named Will Petrac. 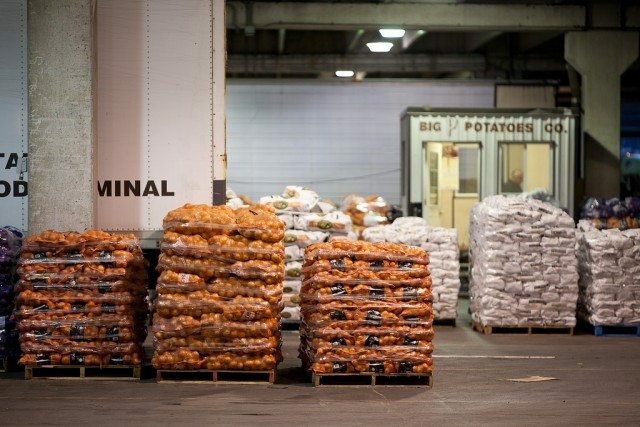 His career is made on forecasting buys off his warehouse’s current inventory levels and anticipated outbound shipments, allowing his customers competitive selection of fruits and vegetables while minimizing Bondi’s shrink—that is, wasted, rotten, or otherwise unusable produce. Petrac squints through the darkness at a printed shopping list. Its contents are a varied selection, and could be mistaken for that of a produce gourmand or seasoned dinner party host, save for the extraordinary quantities—among them, 10 pounds of sugar snap peas, 28 pounds of asparagus, and 43 cases of roma tomatoes. He’s expecting to collect the entire list with a single stop: the Ontario Food Terminal. Petrac drives northeast in his grey Chevy Malibu. The trip is notable for its total absence of traffic, something he explains is a happy side benefit of working the overnight shift in a city notorious for road congestion. We pass through a security gate and onto the OFT grounds. The place has a futuristic, industrial feel: bright white lights illuminate the great expanse of open space set against the darkened Gardiner Expressway. Condominiums in various stages of completion loom to the south. Petrac warns me to expect vulgarity. The OFT runs two distinct operations: a farmers’ market, where exclusively local growers hock their produce, and a warehouse market offering imported fruits and vegetables from around the world. Only legally registered businesses can buy and must pay a nominal fee for use of the facility. Sellers are charged rent by the OFT, with famers’ market access wide open and available by the day, and warehouse market tenants locked into long-term leases currently holding a robust zero per cent vacancy rate. Prices at the OFT are informally set to a daily price list made available by the U.S. Department of Agriculture; they fluctuate based on customer demand and vendor supply, with factors as seemingly innocuous as a Loblaws’ flyer promotion depleting inventory levels and pushing up the going wholesale rate. Each vendor issues a single weekly invoice for all purchasing activity, with payment due to the OFT. Once received, the money is doled out accordingly, allowing sales floor deals to be struck in quick succession without concern for the cumbersome exchange of physical cash. Bondi does the bulk of its business with grocery stores and restaurants—the former favouring a sharp cost and commanding a lower per-case purchasing price in exchange for a much higher sales volume, and the latter emphasizing quality and paying a higher per-case price due to the comparatively small size of their orders. Exact numbers are kept close to the chest, though gross margins tend to blend out at about 15 per cent, depending on what is being bought and sold—a $17 purchase is resold for $20, generating $3 of gross profit, and putting the volume necessary to run a financially sustainable business into mind-boggling focus. An energetic bearded man wearing steel-toed work boots and a faded dark blue windbreaker approaches us. Petrac shakes his hand and talk starts up quickly. The mood is light and carries the kind of hyper-machismo revolving around sports and benign verbal attacks and the price of whatever happens to be for sale. 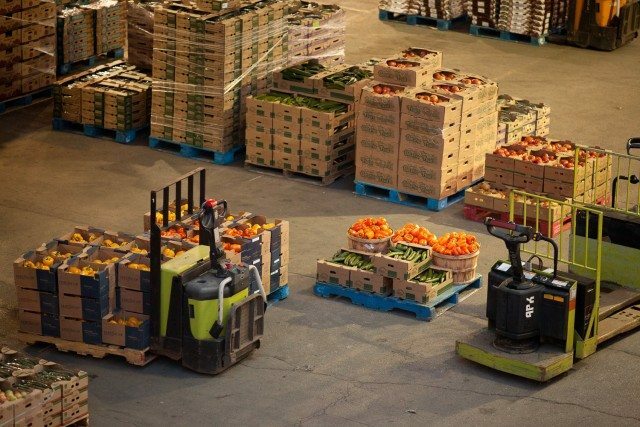 Petrac looks over crates of produce, feeling for firmness, checking colour, asking prices, and barking requests for orders to be sent to Bondi’s loading bay, where a driver will ferry the purchases back to the head office’s warehouse. Petrac places a few orders and extinguishes his cigarette. Selection is light. We move on. The warehouse market is bustling. A cement hallway lit by hanging strip lights provides access to 21 vendors set up in rooms the size of large convenience stores. Raised offices overlook each sales floor, giving the space a production line manufacturing feel. Here, the tastes of the ever-changing and incredibly diverse GTA demographic that took Bondi Produce from an onion and potato operation to purveyors of dragon fruit, habanero peppers, and Thai eggplant are on full display. 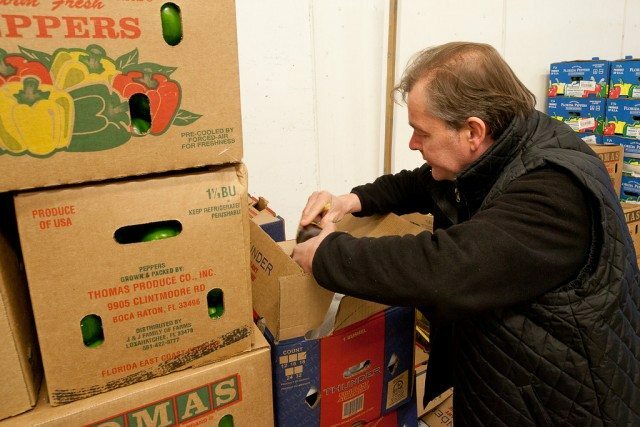 Petrac approaches a crate of Mexican-grown roma tomatoes and is quickly ushered into a low-ceiling basement to look over the entirety of the inventory. A price of $16 per 25 pounds is offered. Petrac tilts his head from side to side and is non-committal. The next seller offers $17 for what are, by all appearances, the same tomatoes. He asks a third seller for a price break to undercut the other two, and gets a lot of stammering and uncomfortable-looking shoulder shrugging, saying a phone call to a superior needs to be made. We move quickly through the warehouse market. A steady stream of men pass in the opposite direction, many piloting some iteration of motorized transport device loaded with crates of produce, and almost all slowing to acknowledge us—expected practice for commission-based sellers. Petrac asks a short heavyset man the whereabouts of a carrot order placed the previous night. The man looks confused, and says he has no record of the 40-odd cases claimed to be outstanding. There’s a lazy exchange of foul language. The man scrunches up his face and looks down at his phone, promising to sort out the issue and hurrying off. An elderly Italian man pulls us onto his sales floor, gesturing to crates of lemons, watermelon, and honeydew stacked four and five high. My gaze rests on a detailed map of the GTA—one of many sprinkled around the OFT. I observe the region’s weed-like suburban expansion and consider the sheer quantity of produce moving through the OFT’s physical space with a burgeoning anxiety. Petrac is being scolded for prying a grape from its stem with unnecessary brutishness. The Italian man turns and offers me a bushel. I accept graciously. Bondi Produce buyer Will Petrac examines a shipment of eggplant. It takes 20 minutes to pass through the entirety of the warehouse market, allowing time for initial observations to solidify. Raspberries are absolutely nowhere to be found, despite Petrac’s best efforts. OFT inhabitants are 99 per cent male, and take a marked pride in the drudgery of physically demanding work. Suppliers appear to be multigenerational, family-run outfits of largely Italian ancestry. Green peppers are going at prices fit for the stingy buyer. Most offices contain a well-used espresso machine, and in at least one case, several framed photographs of a Godfather-era Al Pacino. Petrac is a Bruins fan and will verbally spar with anyone challenging his taste in professional hockey clubs. A surge in customer interest and lack of current local harvest have helped to triple the price of Brussels sprouts compared to other times of the year, which can currently be bought for $85 and $86 per 25 pounds, depending on who you ask. Working the night shifts yields a warm and palpable camaraderie that is felt throughout the OFT. Petrac lights another cigarette as we step back into the early morning darkness. His phone rings, and he fields three calls in quick succession—sellers from the market warehouse are pushing to close. Petrac keeps his exchanges short and business-like, projecting a skilful air of uncertainty as to if and when he’ll return. We circle back to the farmers’ market and enter a small trailer. A desk holds a pile of papers and an old computer monitor. The smell of cigarette smoke is heavy in the air. A rosary hangs from a thumbtack pinning up an employment standards printout from the Ontario Ministry of Labour. On the far wall is a honest-to-goodness nudie calendar. Petrac leans against the desk and requests espressos. A short scruffy-faced man offers us tiny Styrofoam cups without making eye contact. The two exchange words on a recently botched cauliflower deal, the fallout of which is still being worked through by top company brass. Details are murky, though seem to involve Bondi purchasing a pallet of cauliflower from an unnamed OFT vendor and reselling the order back to the scruffy man’s company at a tidy profit, at which time the produce was found to be dotted with discolouration, necessitating a reversal of the sale back to the original OFT owner, lest reputations be tarnished and business relationships damaged. 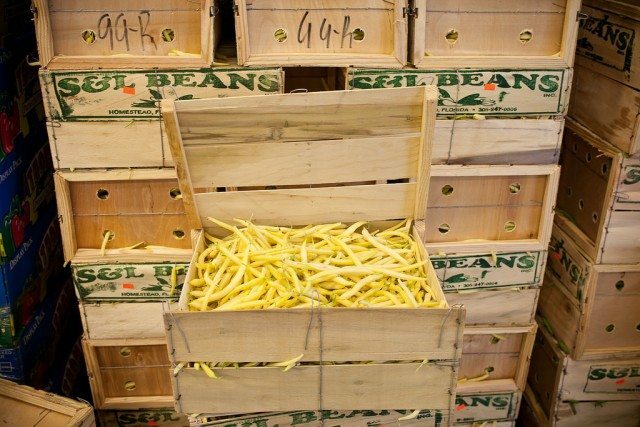 Crates of yellow beans for sale at the OFT. Petrac drains his espresso and places an order for campari tomatoes. We exit the trailer and head for a second pass of the market warehouse. He finalizes arrangements with two roma tomato sellers—his requests for a price break from the third vendor falls through. Petrac’s movements are singular in focus now, and he cuts deals on, among other things, butternut squash, cocktail gherkins, carrots, fennel, figs, and radicchio. Sellers work on hurried autopilot, pointing at crates and shouting for subordinates to ready the inventory for delivery. A second tour of the market warehouse has Petrac resigned to returning short on green cabbage, Swiss chard, and impossible-to-locate raspberries. 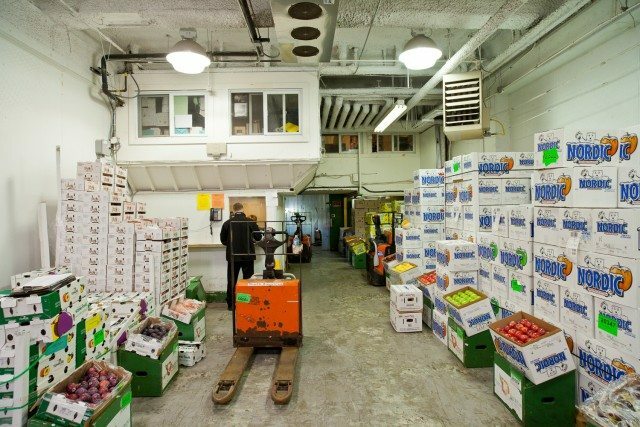 Much of the high-grade produce will be cleared out or accounted for by Toronto’s morning rush hour, leaving flea market and convenience store buyers to scoop up lower grade or on-the-verge-of-going-bad inventory at bottomed-out prices. The whole operation winds down by noon, with doors closing at 2 p.m. and reopening again at 4 the next morning. The cycle of buying and selling and shipping and consuming is well oiled and unrelenting. Petrac will spend the rest of his day trying to shore up missing inventory from suppliers outside the OFT, the last-minute and scarce nature of his request almost assuredly bringing with it an enormous cost premium. We move back through the parking lot as Petrac lights his third cigarette of the hour. The darkness is less absolute now, though dawn is still half an hour away. I reflect with some unease at the extravagant luxury of purchasing seasonal produce year-round, but Petrac seems unaffected by the scope all of it—a consummate professional.